My love for Snickers chocolate bars began about 5 years ago when my husband and I went travelling. No matter what country we were in, Snickers seemed to be available. At times, like in China, I think it was the only Western chocolate bar around. A familiar and delicious remedy for homesickness! 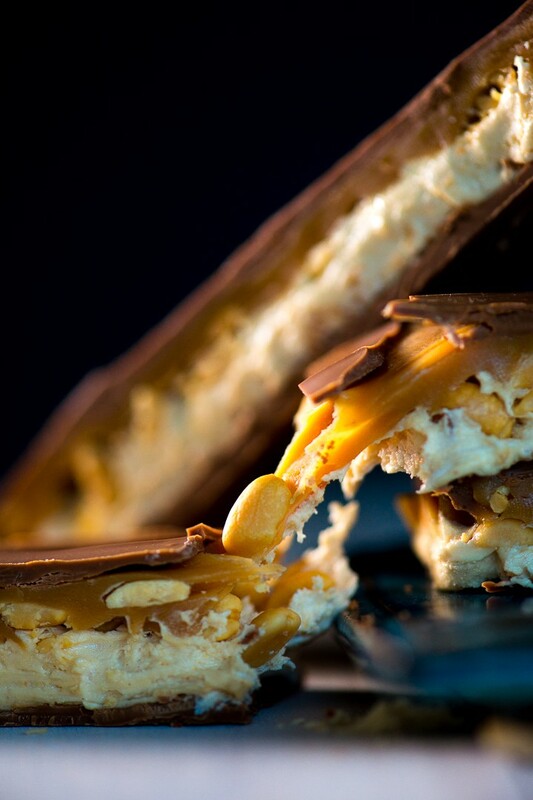 It turns out, Snickers is the most popular chocolate bar in the world and has been around for 90 years! 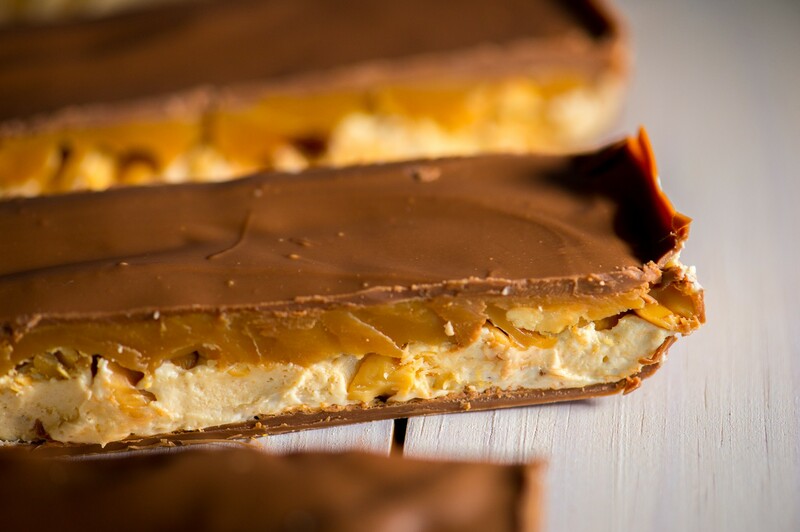 The best news of all is now you can make your very own Snickers bars at home. Although there are a several layers it is actually very straighforward to make, thanks to a “cheat’s” method of making the caramel and the nougat. This recipe makes 20 actual Snickers-sized bars, which should keep you going for at least a weekend! Grease and line a 20cm X 30cm baking tin with greaseproof paper or foil, leaving a 4cm overhang on all sides (this will make it easier to remove from the tin later). Melt the first 200g chocolate in a heatproof bowl in the microwave at 30 second intervals, or over a pan of simmering water. Pour into the prepared tin and place in the freezer. Next make the nougat layer. Place butter, 60ml evaporated milk and sugar into a small saucepan. Stir on a medium-low heat until the sugar has dissolved, then increase the heat and bring to a gentle boil. Stir constantly for 5 minutes until slightly thickened. Remove from heat and stir in the vanilla, peanut butter and Marshmallow Fluff. Carefully spread over the set chocolate layer and return to the freezer. Once the nougat layer has set, remove from the freezer and evenly spread the peanuts over the nougat layer. Press down gently. Place the cream caramels and 70ml evaporated milk into a small saucepan and heat over medium-low heat. Stir continuously until the caramels have melted and the mixture is smooth. Pour over the peanuts and spread as evenly as possible by tilting the pan. You can try using a spatula but it may lift the layers underneath so work gently. Return to the freezer to set. Melt the remaining 200g chocolate and spread evenly over the caramel layer. Place in the fridge to set for about an hour. Lift the foil or greaseproof paper out of the tin and leave at room temperature for 20 minutes before slicing (or the chocolate may crack). I like to dip a knife in hot water then wipe dry before each slice. *Marshmallow Fluff is available at baking stores and some supermarkets. I found mine at Checkers. I can’t come all the way to SA just for Marshmallow Fluff, so I’m hoping I can find it here too! Great photos, BTW. So tempting! It’s an American product so possibly easier to find in Canada than SA!